From left to right: Chong Ah Yu of Gerakan Party Malaysia, John Coronel, former CALD executive director, Siegfried Herzog, FNF resident representative and Adel Tamano, GO spokesperson. With most of the Council of Asian Liberals and Democrats (CALD)’s member parties facing elections next year, the Friedrich Naumann Foundation sponsored CALD fifth communications workshop focused on political campaigns. Held in Pasig City from 18-23 November 2007, the seminar brought together communication practitioners from CALD member and observer organizations for an action oriented learning experience. This year’s recently concluded Philippine midterm elections, especially the Senate elections, offered a wealth of practical experience relevant to other countries as well. Drawing on that, Campaigns and Grey President Yolly Ong set the framework of the workshop by outlining the principles behind political campaign communications. She also analyzed current campaign trends by giving an assessment on the role money and organization played. She also spoke on the decreasing influence of celebrity factors and the increasing influence of issues. Ong emphasized the need to craft a message that is credible and in sync with the candidate’s nature and image, stressing that there are limits to advertising. Participants create a campaign jingle. 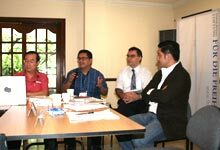 Following this discussion were case studies of two successful Philippine senatorial campaigns presented by their campaign managers. In both cases, campaign funding was limited so the crafting of an effective political message was crucial. Examples of campaign clips underlined the arguments of the speakers. It gave participants impressions of successful and unsuccessful messages. Participants also met with Attorney Adel Tamano, spokesperson of the Genuine Opposition (GO) of the Philippines. He described the organization’s setup and the strategic decisions involved in crafting its effective political message. He also talked about creating a successful media plan. He summarized GO’s as: know yourself, do your homework, know your message and be cool.